If you compost at home, compostable bags can help make the job a little easier. Understanding what makes them different from biodegradable and standard plastic bags can help you learn the best environment for keeping them in. Whether you have been composting at home for a while, or you're just starting out having compostable garbage bags can really make a big difference. Many composting guidelines will encourage you to keep your garbage in small lidded containers, like empty food tubs, before emptying these containers outside. This then necessitates the washing of the containers, storing of them and other hassles that can be daunting to a first time composter. Compostable garbage bags, such as Glad compostable bags, fit right into your kitchen trash can. Glad has been producing plastic bags for household needs for years, and they have taken concerns such as bag tying and size into consideration with their compostable bags. You can fill the bags with your compostable garbage, tie them up and bring them straight out to the compost heap. Just put the whole bag down, and you're done. This can really speed along the process and help ensure that the composting will actually get done. Unlike standard plastic bags, and even some biodegradable plastic bags, compostable bags are made of vegetable matter, such as corn or potato starch. When exposed to enough moisture, the bags will compost, right along with whatever was placed inside them. Standard biodegradable bags may just break down into smaller and smaller pieces of plastic. While this is better for the environment than a regular plastic bag, and biodegradable bags will never wind up in the ocean in a large piece, they can still contaminate the environment with plastic chemicals. Glad's bags are both biodegradable and compostable, which is a key distinction. 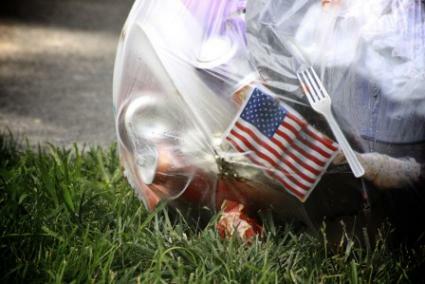 Just because a bag will degrade faster than standard plastic, does not make it compost ready. If you are considering using compostable bags, first make sure that you are using the bags labeled "compostable". Green recycled bags are not compostable. While biodegradable and compostable plastic bags have a long way to go before becoming perfect, compostable bags are a step in the right direction. When used with a composting system that is already in place, they can be a valuable tool to help your compost heap along. As an option to regular garbage bags, when taking the trash to the dump, they may not stand up to the job. Take a look at your garbage bag needs and see if compostable bags will help your situation. If so, it is another step you can take toward a greener and cleaner lifestyle.